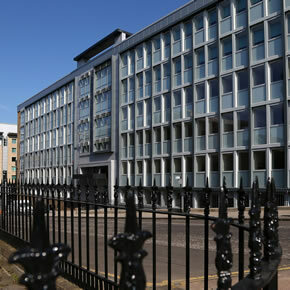 CMS Window Systems has supplied a number of aluminium windows to an old Scottish building, which has been renovated into student accommodation for the Glasgow School of Art. With more and more young people deciding to progress into higher education, the UK’s universities are working to address the growing demand for student accommodation. Although it would be ideal to erect new builds, site availability in city centre locations is often limited. For this reason, developers have started refurbishing disused buildings for new students to move into. The Glasgow School of Art (GSA) contracted Developer Cityheart to transform a redundant eight-story building into accommodation for its students. Based near the university’s Garnethill campus, Blythswood House has been renovated into student residences for its 2015 intake. The building provides 218 rooms, which have been arranged into flats of six to eight over six floors. Each flat comprises a communal kitchen, dining and seating areas. Self-contained apartments have been included at ground floor and roof level for the building’s warden, visiting lecturers and tutors. The building also includes a gym, cinema, workshops and exhibition spaces. CMS Window Systems was contracted to design, manufacture and install a number of aluminium windows for Blythswood House’s external envelope. The company used its Metal Technology 4-20 thermally broken system to provide over 500 windows; bespoke panels were also fitted as part of the external envelope refurbishment solution.